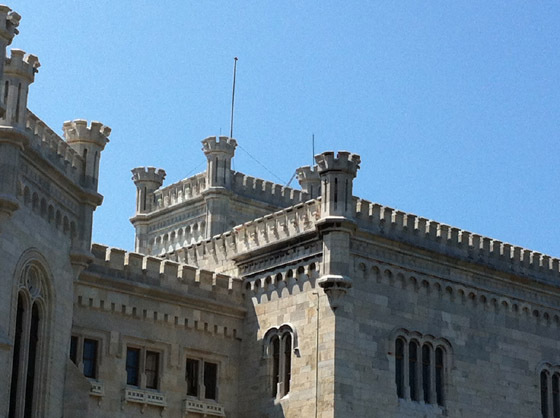 Strawberry Hill Stories | Where travel meets fun meets reading meets cooking meets family. Where travel meets fun meets reading meets cooking meets family. There hasn’t been a lot of snow in Vienna this season. We didn’t even have the white Christmas we’ve all been longing for. So, when these few snowflakes decided to cover the city, they were more than welcome. 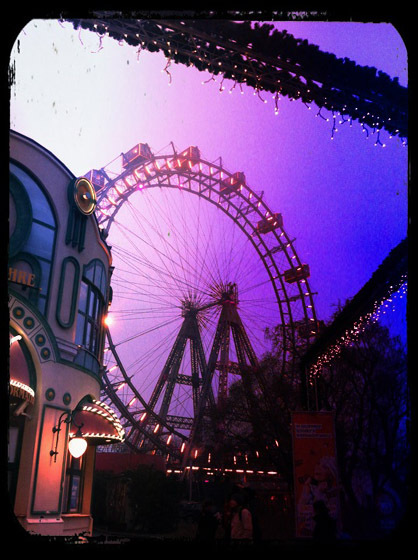 Here are some photos of Vienna, taken this January, some of them with and some without snow. 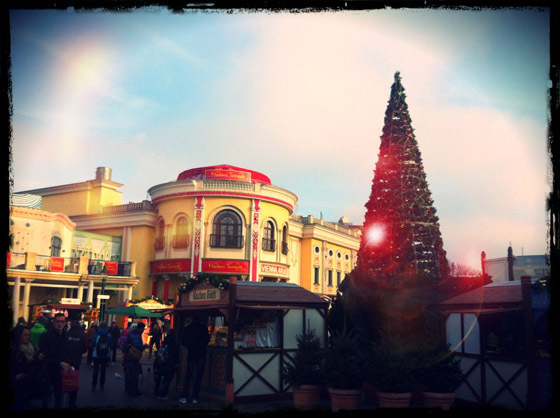 First, the beginning of the year in Prater; during the first week of the year, the Wintermarkt still took place, with beautifully arranged booths offering food, drinks, souvenirs and sweets. Winter is somehow very nice, with or without snow. The air is cold and crisp, and everything looks sharper and clearer. The sky is bright blue and the sunset has all the beautiful colours, from pink to dark blue. However, even the smallest amounts of snow make a difference; it somehow makes the city noise quieter and everything looks, well, white and romantic. 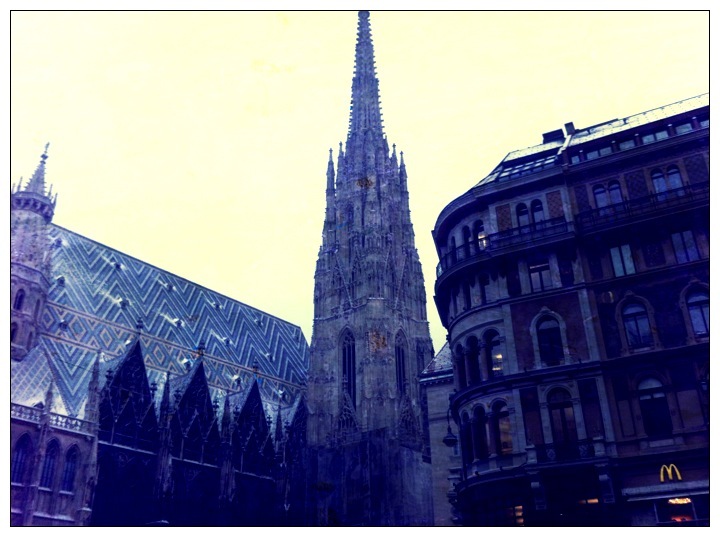 Here is a photo of Stephansdom. 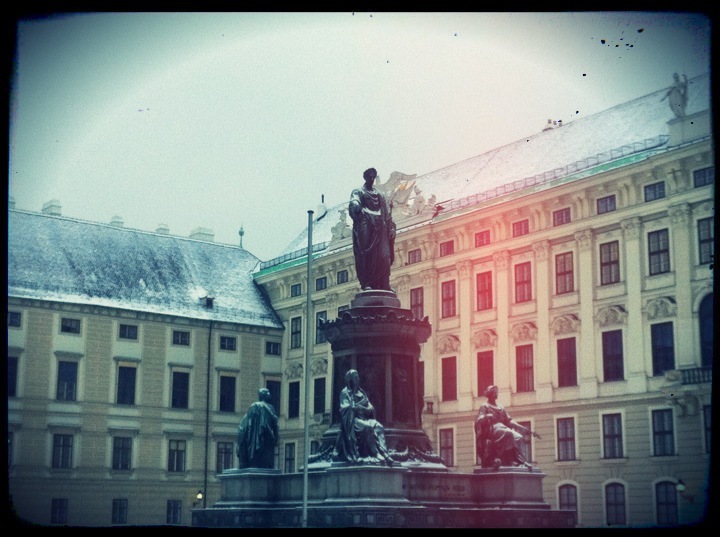 Just a short walk away – the Hofburg. 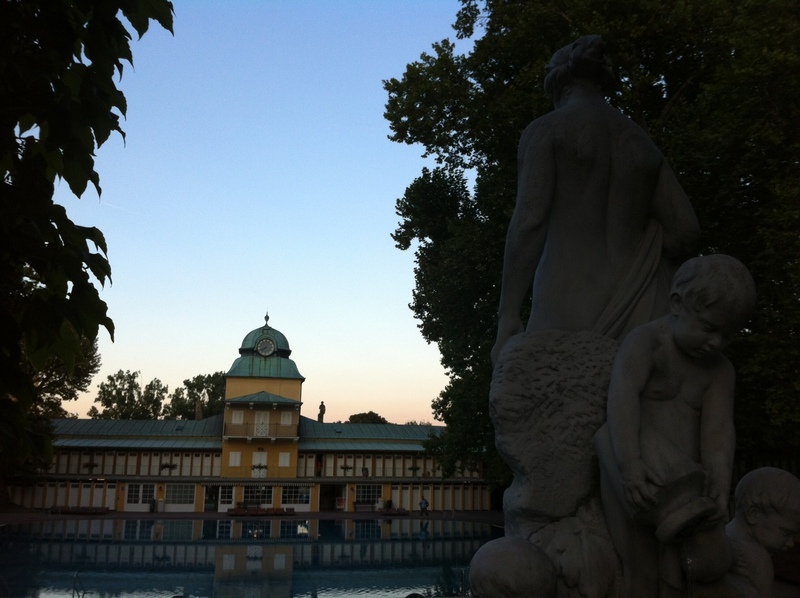 And, finally, one of the most romantic places in Vienna – Spittelberg, in the 7th District of Neubau. Known for its narrow streets and artistic shops, during the Advent time it is full of people who frequent its Adventmarkt, one of the most popular in Vienna. However, the booths are removed by the beginning of the January and it again becomes a peaceful and quiet neighbourhood. I know it’s cold and it can be unpleasant, but try to enjoy this time of year… It’s beautiful! I consider my command of German to be pretty good. I’ve learnt it in high school, I’ve spent many summers of my teenage years in Germany, learning the language on the spot (as it was oh so popular back in the 1980s), I have been a fan of Nena and Falco, I’ve read Goethe and Böll, I’ve watched Fassbinder’s films and Elfriede Jelinek’s plays and I have even written my PhD thesis in German, which should all count for something. I have been living in Vienna for some time now, I speak German every day, I listen to Austrian radio stations and so on, and so forth; however, now and then I can still get quite amazed by the new and imaginative ways this language finds to torture us, the unsuspecting foreigners. The puzzlement doesn’t come accross very often nowadays; however, when I first moved to Vienna, there have been quite a few perplexing situations. Let’s start from the beginning. When you live in a non-German speaking country and learn German in school, what you get is a standard version spoken in Germany, the so-called Hochdeutsch. And it teaches you that before a meal, you should say guten Appetit, which translates into something like enjoy your meal. However, as I ate some of my first meals in Vienna in the common room of my student dormitory, all of the colleagues who happen to walk by said Mahlzeit, which literally means meal. I was beyond confused. Ok, I thought to myself, yes, it is a meal. So what? The confusion grew even bigger after I saw people pass each other in the university hallway sometime around noon, saying Mahlzeit and replying with the same word. I thought I have entered a freaking twilight zone. Finally, I asked one of my colleagues to explain why do they point at each other’s food, emphasizing that it is a meal. And, furthermore, why do they keep saying this peculiar word to each other for no obviour reason whatsoever. After my colleague recovered from the laughing attach, he explained that in Austria, it means guten Appetit. If you use the Hochdeutsch version, you are considered to be stuck-up and aloof. It is also used as a greeting around the lunchtime. So go figure. In English and most other languages I’m familiar with, people usually say Happy New Year, which indicates that the sender of the message wishes good luck for the recepient’s whole year. Not in Vienna. Here, you are told that you should have einen guten Rutsch ins neue Jahr, meaning a good slide into the new year. So, the wish covers merely the first few minutes of the year. Once you’ve slided into the new year, you’re on your own. The wish doesn’t extend any further. When wishing someone a Merry Christmas, one usually says fröhliche or frohe Weihnachten. However, in 2012 I started getting wishes for my Christmas to be schön (beautiful, lovely), rather than merry or jolly. The trend has developed so quickly, that almost all of 2013’s Christmas wishes said the word beautiful. Let’s wait and see what happens next with the good old Christmas in the years to come. Now, we’re entering a sensitive ground, because if you don’t know your food, you’re about to end up hungry or at least with a strange thing placed on your plate. Forget most of what you’ve learnt in school or at least leave it for your trip to Germany. In Vienna, you don’t eat Brötchen, but Semmel (bread rolls) and you don’t eat it with Quark, but Topfen (cottage cheese). There are no Tomaten in your salad, there are Paradaiser (tomatoes) and with meat, you don’t get Kartoffeln, but Erdäpfel (potatoes). Finally, if you want to flush it all down with beer, you should order either Pfiff (0,2 dcl), Seidl or Seitl (0,3 dcl) or Krügerl (0,5 dcl). Oh yes, those letters indeed have the meaning of words. I is shortened for ich (meaning I), and A stands for ein (an indefinite article). Which makes the following sentence completely legitimate: I mag a bissrl ____ (insert a wish of your choice). 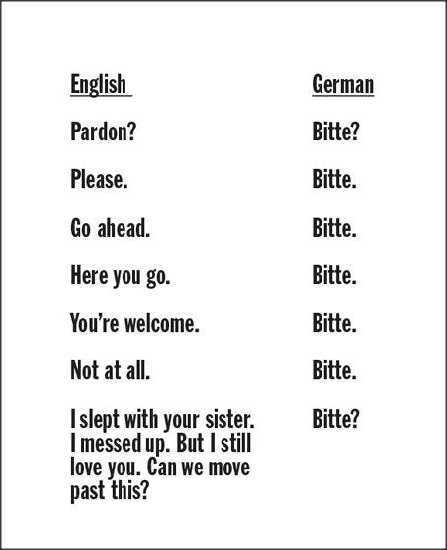 Of course, the list is almost endless; don’t get me wrong, I love the German language and I love its Austrian version. However, if you come to live here unprepared or ill prepared, you’re about to encounter some surprises. That’s all. So, after a pretty long break, here’s a new post, finally. 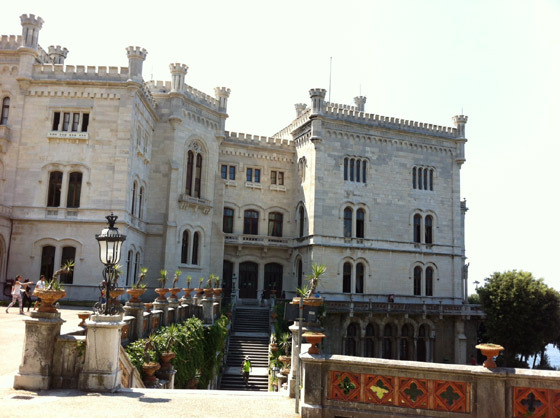 It’s about a short trip we took to the beautiful city of Triest and the Miramare Castle, which is just a short drive outside the city. Since our girls love both castles and the seaside, this trip seemed like a perfect combination. 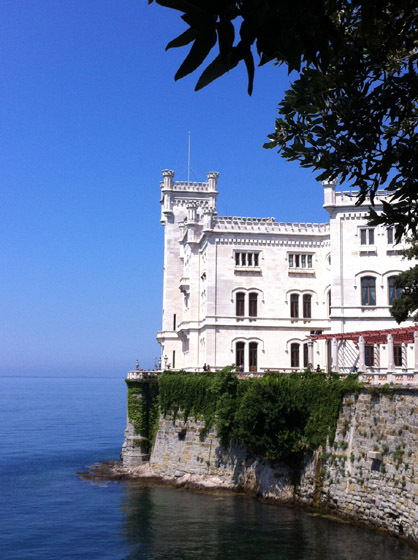 First things first – the Miramare Castle. 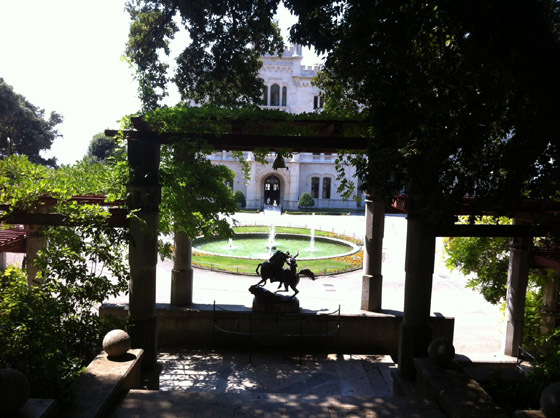 It’s been built for Ferdinand Maximillian, a member of the Habsburg family, and his wife, Charlotte of Belgium in the mid-nineteenth century. 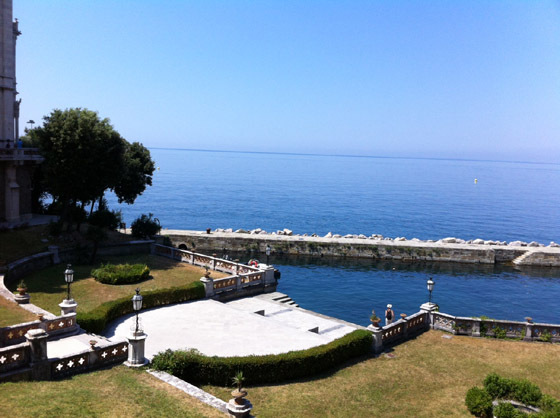 It’s situated on a cliff a bit outside Triest, one of the largest harbour cities of the Northern Adriatic. It is open to public and the ticket costs merely €4 for adults and the admission is free for EU citizens up to the age of 18. 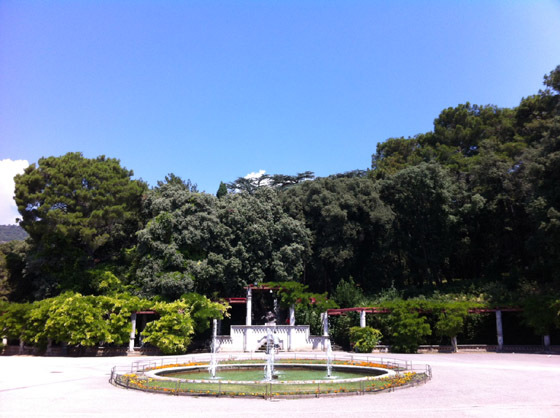 The castle is surrounded by the beautiful botanical gardens overlooking the sea, a mixture of the Mediterranean plants and plants that had been brought from all around the world by one of the gardeners. If you happen to be in this area or are planning to visit it, I would recommend including the Castle into your trip. Along the road connecting the Castle with the city, there is a beautiful, long beach with lots of chic cafes and places to hang out. 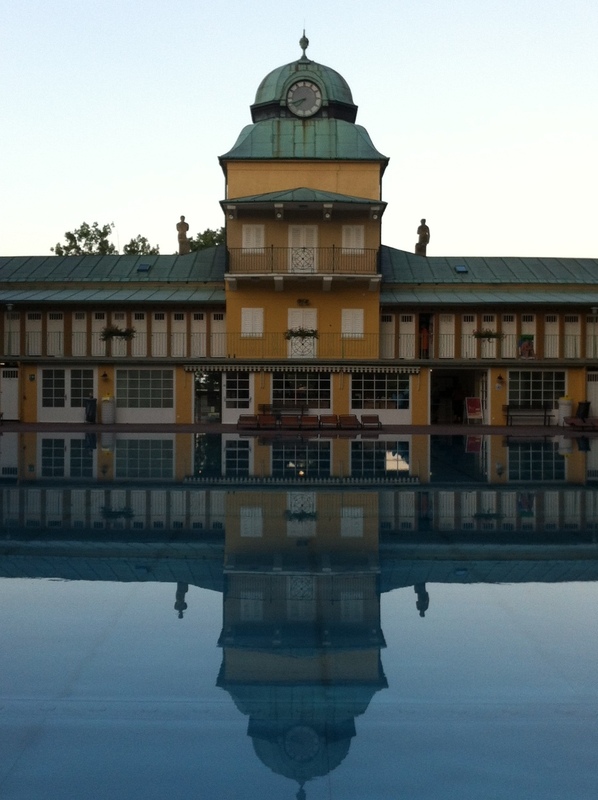 So, if you’re into taking a swim, you can do it right there, with the view of the castle. 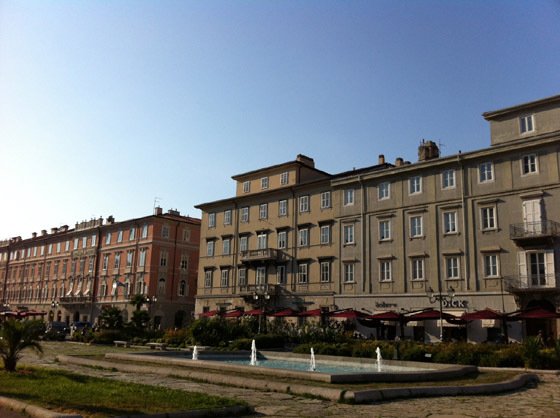 Triest, a large harbour city, is merely a short drive away. Although not as famous or attractive as the nearby city of Venice (which we’ve visited the previous year, please check the links on the right), it is definitely worth a visit. 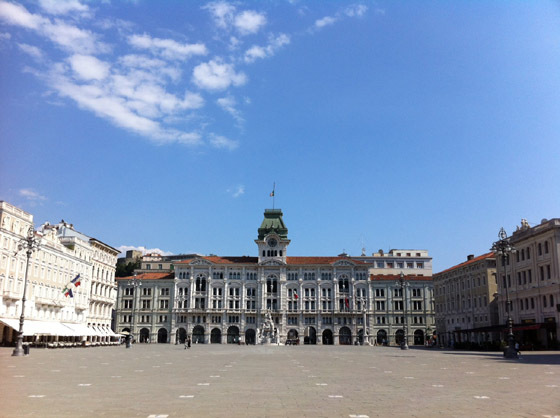 Once a lively merchant city, at the beginning of the twentieth century Triest has given refuge to many of the artists and writers, the most famous being James Joyce, who was permanently living in Triest, Paris and Zurich. Today, there are many signs of Joyce’s presence in the city and many restaurants and cafes boast being his favourite places. 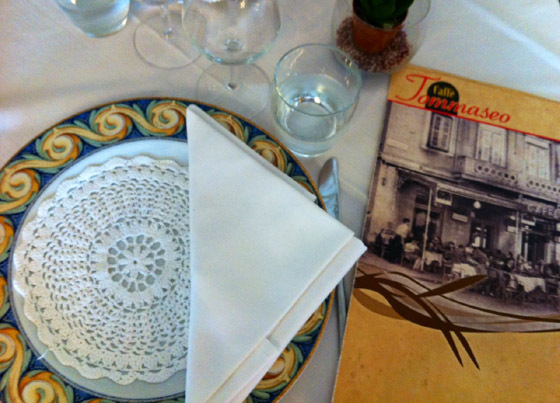 We’ve dined at the Tommaseo, a mixture between a coffee house and a restaurant well known for its famous patrons from la Belle Époque, such as James Joyce and Sigmund Freud. Surprisingly, the prices were very reasonable, the food and wine were excellent and there’s even a children’s corner, where our girls spent some time after lunch reading, drowing and playing while my husband and me drank our coffee. 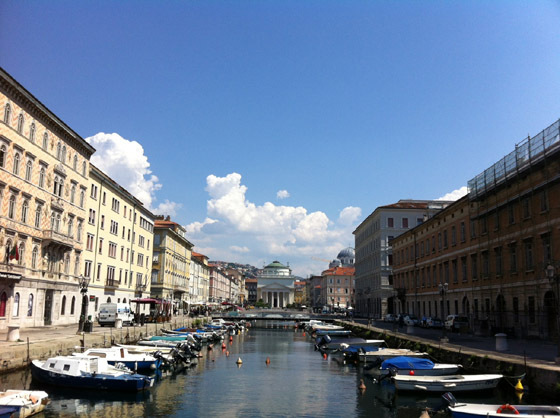 Did you now that there’s Canale Grande in Triest as well? 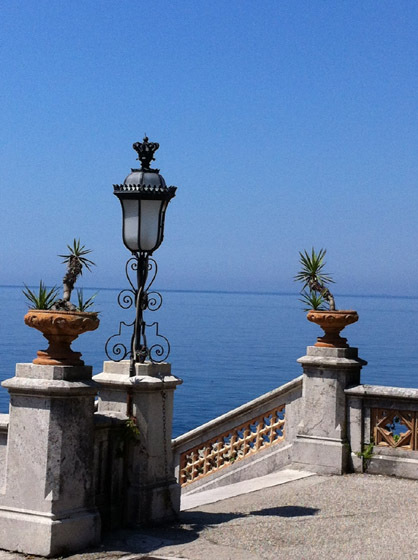 Here it is – it starts at the seafront and ends with the Catholic church Sant’Antonio Nuovo. 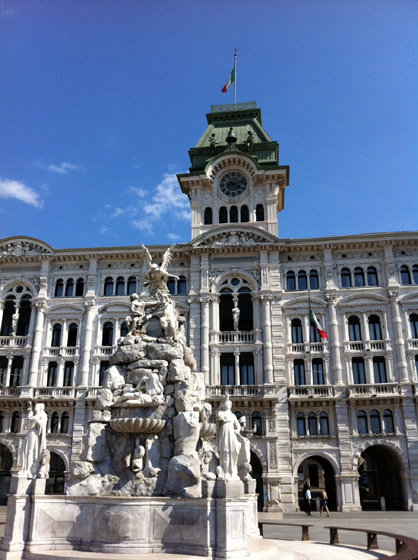 Piazza della Unita d’Italia of the Italian’s Unity Square is the main square, housing palaces such as the City Hall. It is very large and I’m afraid I haven’t really managed to capture its size in my photos. 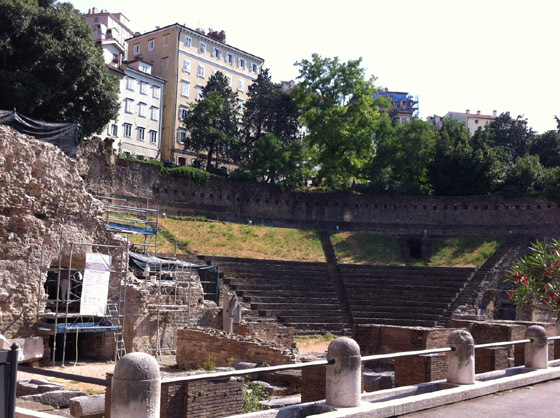 A short walk through the busy streets will get you to the Roman Amphitheater from the 1st century AD. 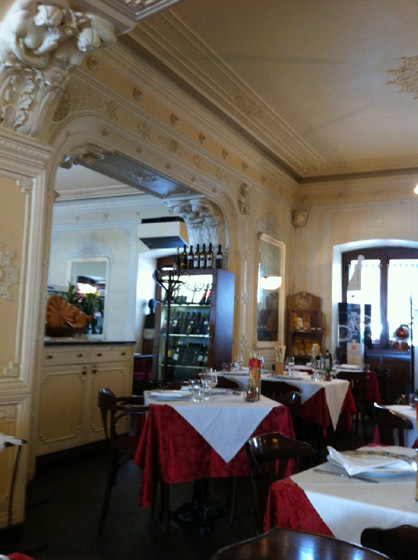 It is situated in the city centre and is currently being renovated. Now, it can’t all be perfect, can it? As we were tired from the sightseeing, we decided to sit down at a nice street cafe in the midst of the pedestrian zone, in one of those chic shopping streets filled with beautiful designer stores. Alas, the Caffe Stella Polare was a big mistake. I sat at the table with our younger daughter, while my husband and our older daughter went in to see what sorts of ice cream they offer. So, the two of us placed an order with a grumpy old waiter and when my husband and other daughter came back to the table, he simply didn’t want to take their order! He just ignored their attempts at talking to them either by looking through them or by turning his back. It was unbelievable and it was only when my husband, after twenty minutes of failed attempts to place an order, went inside and talked to someone else, that they’ve got what they wanted. 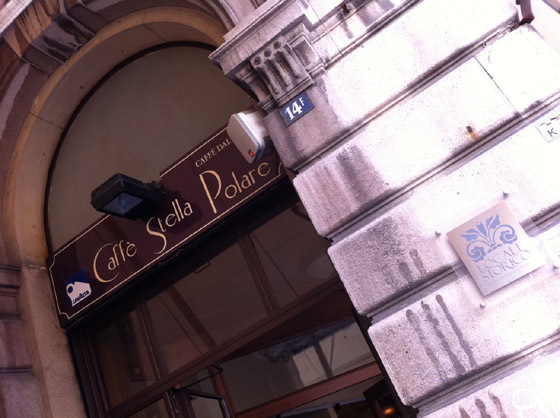 So, unlike the Tommaseo, which I would gladly recommend, the Caffe Stella Polare is to be avoided. As the plate beside the entrance boasts, Joyce was a regular here as well and I think that I’ve discovered the secret to his long sentences; he was just immensely bored and had to do something with his time while he was waiting for his coffee. 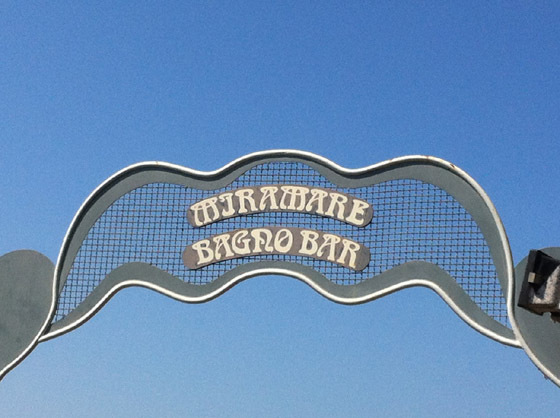 However, the story with the arrogant waiter didn’t ruin our trip. 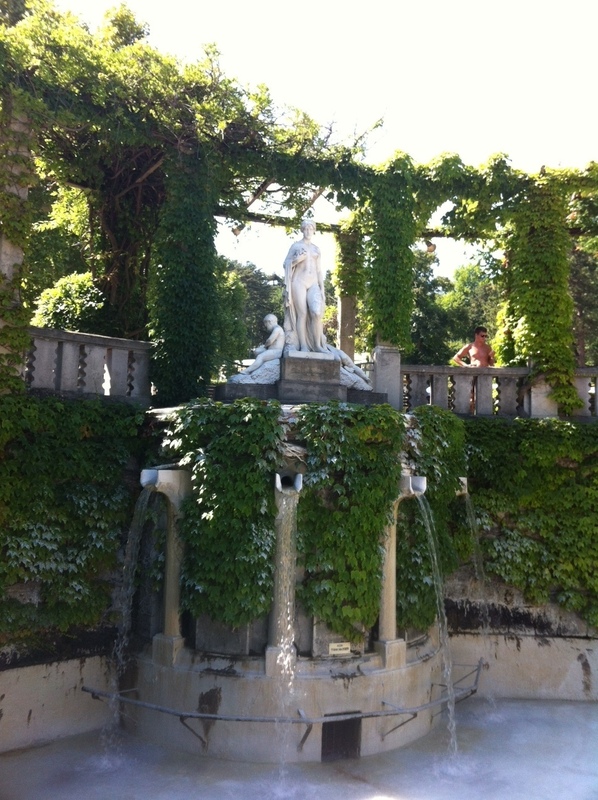 We still had a great time, visited a lot of nice places and would love to return here. 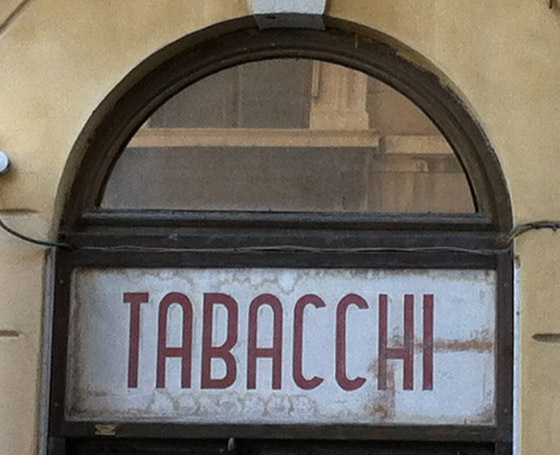 Triest is a very charming place. If you like this post, please go to my FB page, click like and share it with your friends. 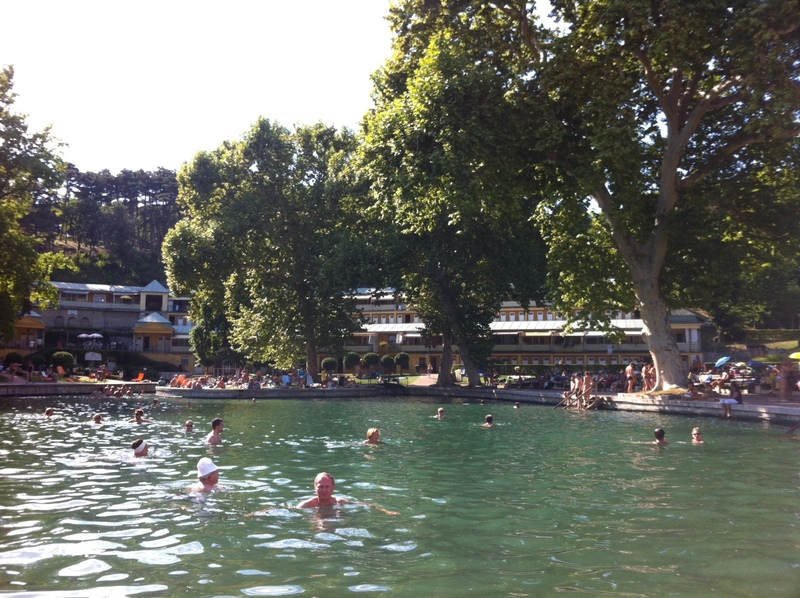 So, we’ve returned from our summer vacation, and not only that, we’ve been to some great places in Austria lately, one of them being the Thermalbad Vöslau in the beautiful and picturesque town of Bad Vöslau. 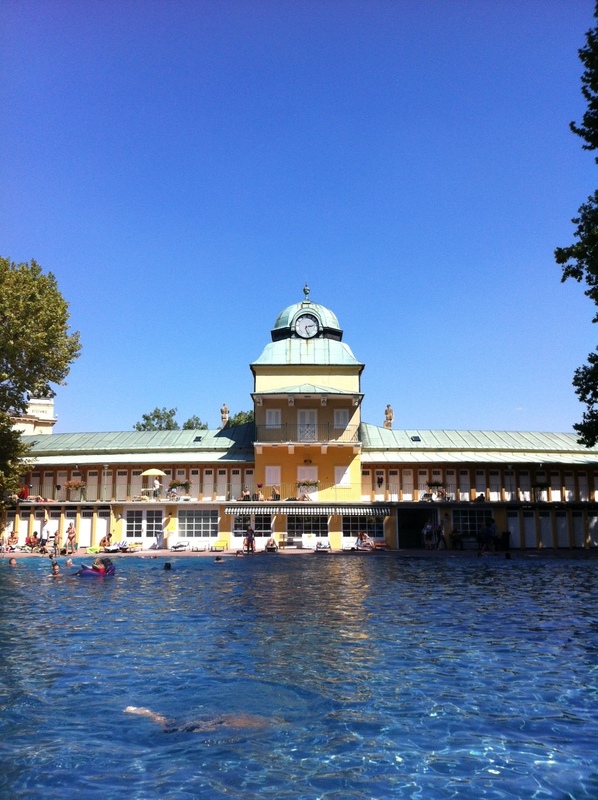 It is near Baden, only a short drive from Vienna. 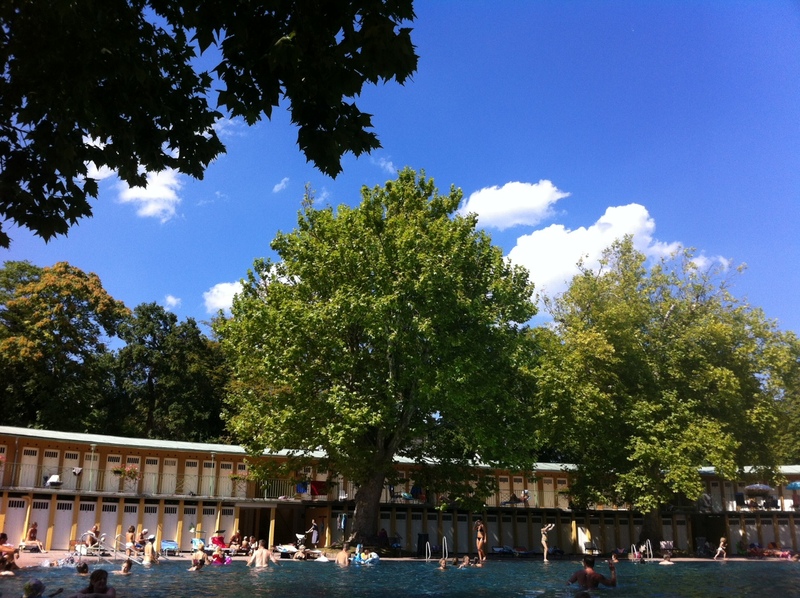 This is the view of the first pool, the so-called “blue pool” (das blaue Becken); the water temperature is very pleasant and the water is crystal clear. We’ve tried swimming with the goggles and we’ve managed to get a perfectly clear underwater picture of people swimming on the other side of the pool! Can you imagine that?! My girls loved it! 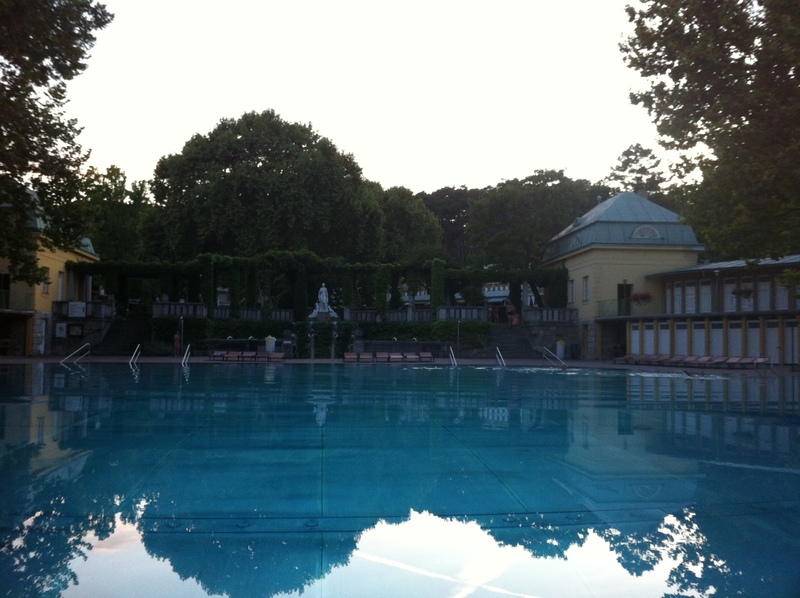 Further into the spa, there is the green pool (das grüne Becken). Its water is very cold and we haven’t managed to get into it. However, there were many people swimming in it, so I guess we must have been spoiled by the warm sea water, because we’ve returned from our seaside vacation merely ten days earlier and were used to very, VERY high water temperature. 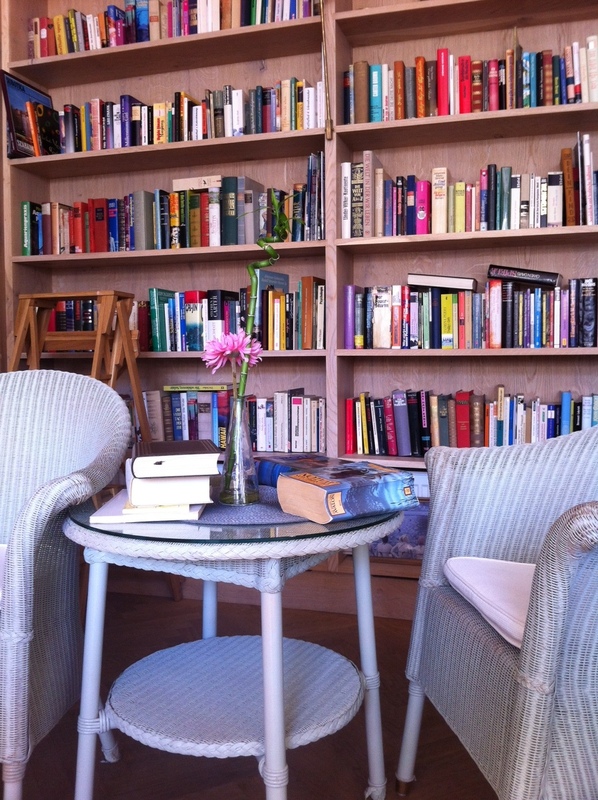 A nice surprise from our last visit; besides the restaurant and cafe, there is a small library where one can take a book, read it and return it upon leaving the spa. What a great idea! There are some children’s books as well, even some in English, and my girls really enjoyed the place (which enabled me and my husband to have a cup of coffee in peace). 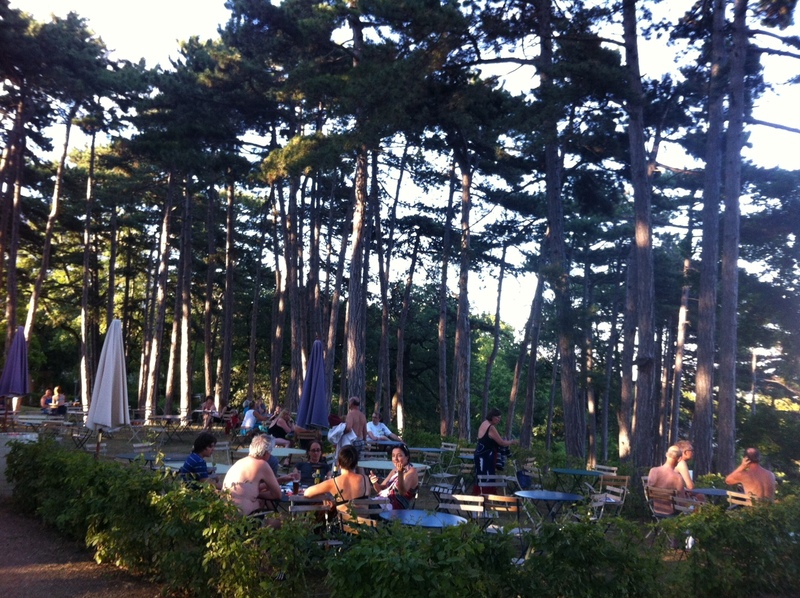 Besides the green pool, there is a meadow where a lot of people enjoy themselves in the shadows of beautiful old trees. 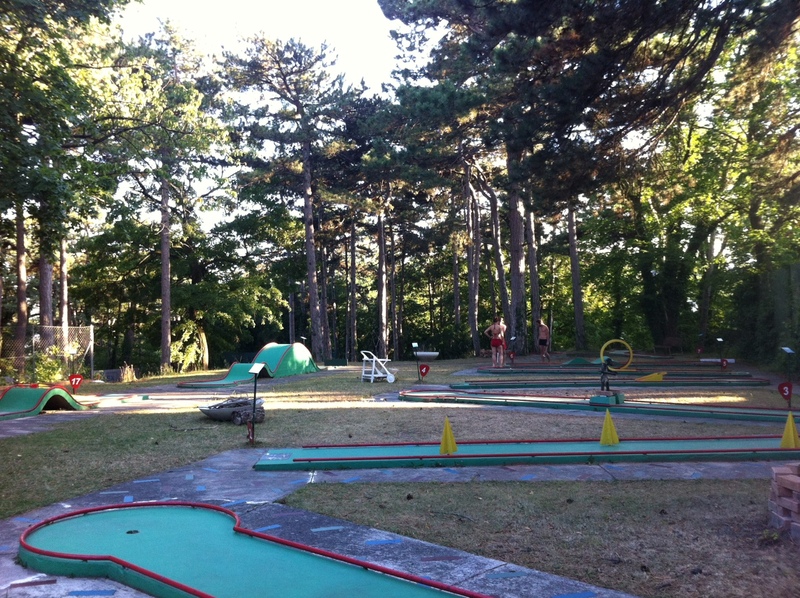 The spa complex is very large and there are lots of things to do; for example, you can have your coffee or snack in the woods, play tennis, table tennis, beach volleyball or mini golf… There are children’s playground and pool (das Kinderbecken) as well. One of the most beautiful things there was the forest pool (das Waldbecken); we haven’t tried swimming in it, but just looking at it was pure joy. 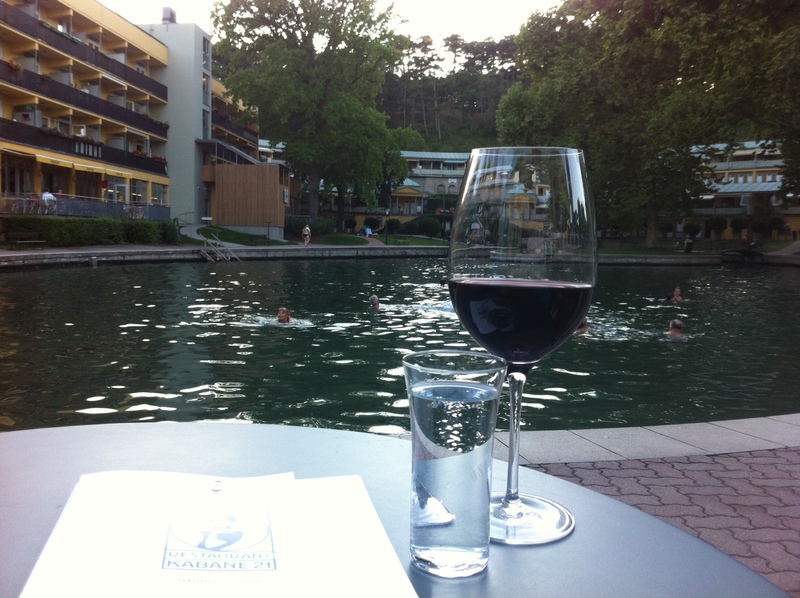 After the whole day of swimming and having a great time, my husband and me needed half an hour to relax. Fortunately, besides the library, there is also a tv-room where numerous children were watching cartoons. Our girls went in there and stayed for a while, and the two of us sipped some red wine, overlooking a sunset at the green pool. As we were one of the last people there, we needed to get going. 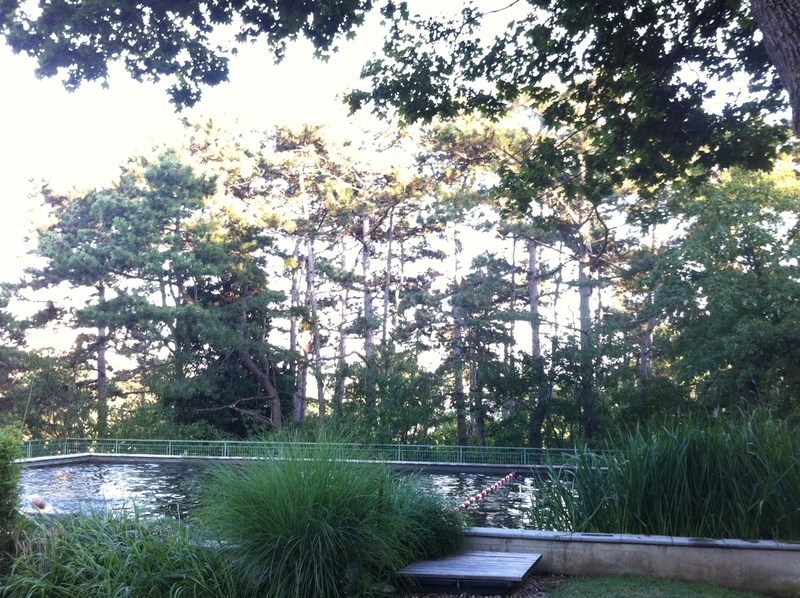 Being surrounded by the beautiful nature, warm air and enjoyable breeze, we found it hard to leave. 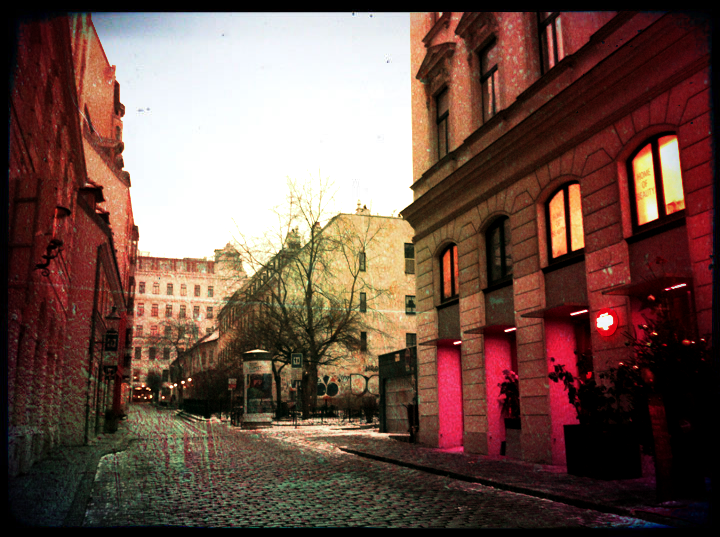 So, we took a couple of more photos to take some of the calm, evening atmosphere with us to Vienna. So, that’s all folks! It was a great trip and we are looking forward to repeating it! Please stay tuned and if you like my blog, please like my FB page or share my posts with your friends! 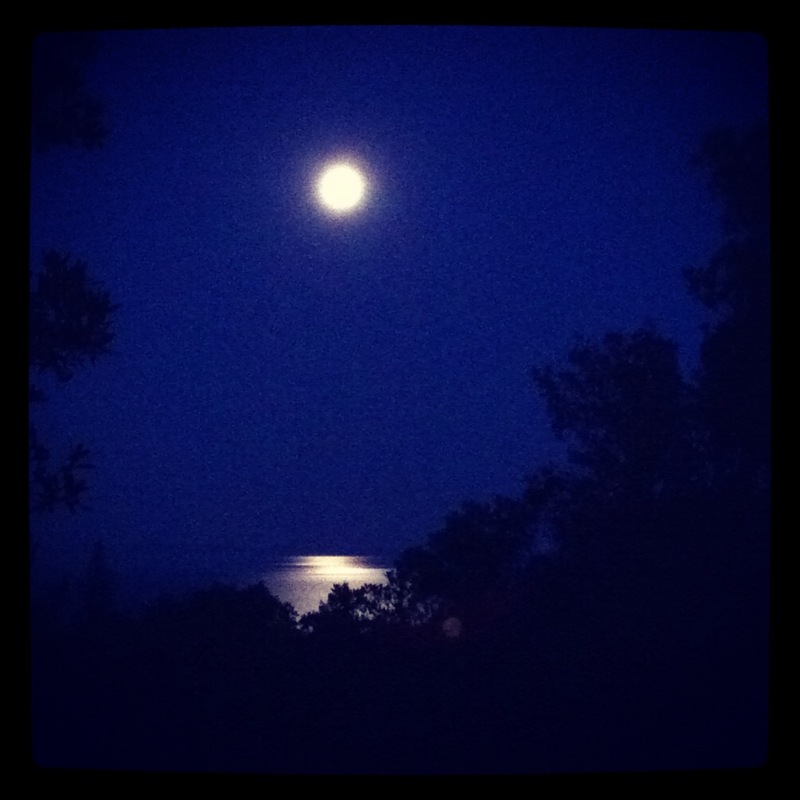 No, I haven’t abandoned this blog, I’m just taking the summer break, so until the next post, I’ll quickly share with you a photo of full Moon over the Adriatic sea, taken yesterday evening in Duga Uvala.